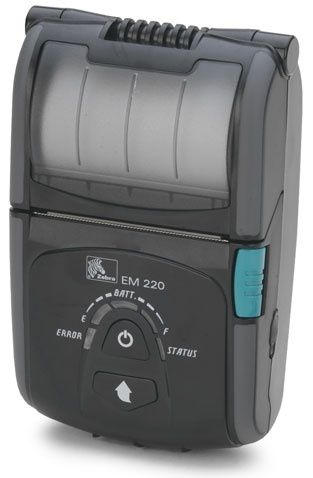 The EM 220 mobile printer is the smallest receipt printer in Zebras family of compact mobile devices. This lightweight direct thermal printer - a mere 240 g with battery - provides professional performance in all kinds of mobile applications, making it the ideal device for pubs and restaurants, field work and events. Convenient, single-handed operation makes even refilling paper an easy task. Thanks to its low weight, it is ideal for being carried in a pocket or fixed to the belt using the provided clip for quick, on-demand printing. You print 58 mm wide receipts in no time its printing speed of 80 mm per second at 8 dots/mm 203 dpi eliminates waiting periods, while the large number of standard and bar code fonts substantially minimises delays at the cash desk. Standard features also include a paper-end sensor and an LED battery display that provide users with continuous status information. Besides the standard version with a USB and serial interface, the printer is also available with a Bluetooth 2.0 interface that provides wireless connection with further mobile devices and wireless networks. The EM 220 also supports the established ESC/POS protocol, which ensures easy integration into common software environments. Thanks to its powerful lithium-ion battery, the mobile printer is at employees disposal for over eight hours of operation without interruption. Its particularly compact housing 80x127x44 mm allows the printer to be integrated ergonomically into the users workflow and withstands drops from a height of 120 cm. You may also benefit from an extended functionality, as the EM 220 is also available with an integrated magnetic stripe reader. Credit and customer cards can be read directly and information is processed systematically. The reader is incorporated into the housing and is released with a simple press of a button. This patented system guarantees high ergonomics and professional protection. In addition to the mobile printer itself, the scope of delivery includes a battery charger, a belt clip and a CD with all installation and configuration tools. An extensive range of accessories, such as interface cables, spare batteries, a leather sheath, vehicle and multiple chargers is also available on request.